The Canwa Vancouver 1 team prevailed in the finals of the Pandanet AGA City League, played Saturday in Boston, MA as the 2016 US Go Congress got underway. Vancouver — Hanchen Zhang, Bill Lin, Ryan Li and captain Cathy Li (photo at right) — swept 3-0, overcoming a strong challenge from the Greater Washington team (left; Zirui Tim Song, Eric Lui, Yuan Zhou and captain I-Han Lui) which has now challenged for the title the last two years. Board 1 was broadcast live on the AGA YouTube Channel with Hanchen Zhang 1p vs Zirui Tim Song 1p. Ryan Li defeated Eric Lui on Board 2 and Bill Lin defeated Yuan Zhou on Board 3. Photos of the event can be found on the AGA Facebook page. Pandanet City League Finals live! 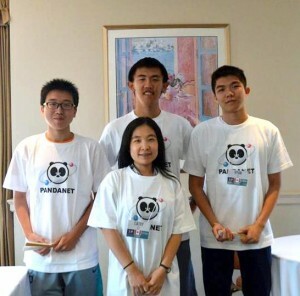 In one week the Pandanet AGA City League Finals will be played in Boston, MA at the U.S. Go Congress. Canwa Vancouver 1 will take on Greater Washington for the championship. Canwa Vancouver won the second year of the tournament. Greater Washington has been in the finals before. 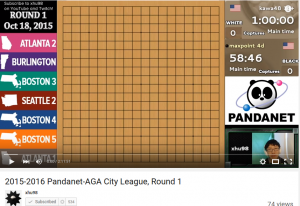 All games will be broadcast on Pandanet in the AGA City League room at 3pm EST. Vancouver has climbed slightly ahead of Greater Washington in the A League. They are 5-1 each against the rest of the field. With two professionals for each team (Chinese and American professionals), play has shown the strength of their players. Los Angeles has been hot on their heels all year with Boston one game behind them. Washington DC 2 has taken a commanding lead all year with their undefeated streak. Edmonton has taken one loss this year. We’ll have to see who leads the middle of the pack between Washington DC 1, New Jersey, and San Francisco 1. The C League is led by Atlanta 2, followed by Boston 3, and Atlanta 1. As the third round of the Pandanet AGA City League closes out, some leaders are emerging from the packs. In League A the Greater Washington and Canwa Vancouver 1 teams have always been at the top of the leader boards. Both teams are undefeated in their league. Two-time winner Los Angeles is in third place at this point. Washington DC 2 has come out strong this year, leading with three wins so far. Close behind is Washington DC 1 and San Francisco 1. League C has Atlanta 2 leading with the third round. Their opponents have some catching up to do for the last four rounds. Boston 3 is close behind Atlanta 2. Click below to watch Hajin Lee 3p review two games from the A League. This round she looked at new 1p Eric Lui’s game against Edward Kim 7d and Bill Lin’s win over AGA professional exam contender Aaron Ye. Learn why joseki is important throughout the game in this video. Three of the eight competitors in the recent 2015 AGA Professional Qualifying tournament are players from the AGA City League. They are tournament winner Eric Lui 1p of the Greater Washington team, Aaron Ye (Bay Area team) and Jeremy Chiu (San Francisco 1 team). 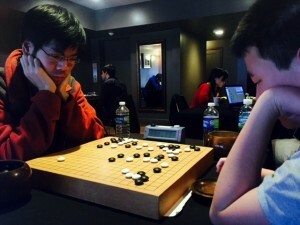 Ye (right) gave Eric Lui (left) a tough challenge in the final matches of the tournament. Other professionals who play in the AGA City League are Ryan Li 1p (2014 AGA professional, Canwa Vancouver 1 team), Tim Song 1p (Greater Washington), and Huiren Yang 1p (Boston). Round three of the AGA City League will take place this Sunday, January 24 at 3p EST. Throughout the day you can catch your local and favorite players from around the US and Canada. Check the schedules for each league to see when they are playing: League A, League B, League C.
Round three will have a game review from Hajin Lee 3p. Watch all of the live coverage on Pandanet app on your Windows, OSX, linux 32bit and 64bit, iOS, or android. Games will be played in the ‘AGA City League’ and ‘AGA City League (Manual)’ Rooms. As the second round of the Pandanet AGA City League concludes, a few contenders have risen to the top of the field. Two teams in each league have won their first two rounds; Greater Washington and Canwa Vancouver 1 in League A, Washington DC 1 and 2 in League B, and Boston 3 and Atlanta 2 in League C. The next round will be January 24th. This month bring us a review by Nick Sibicky. He talks about “Seattle’s Secret Weapon” in the A League in his first two games of the season. Sibicky adds that “teams are the way to go” when watching go as a spectator. Another exciting round of games for the Pandanet-AGA City League starts this Sunday. Check the schedule to see who your favorite team is playing. Will Canwa Vancouver, Washington DC 1, and Atlanta 2 keep their leads? We’ll see after this round! 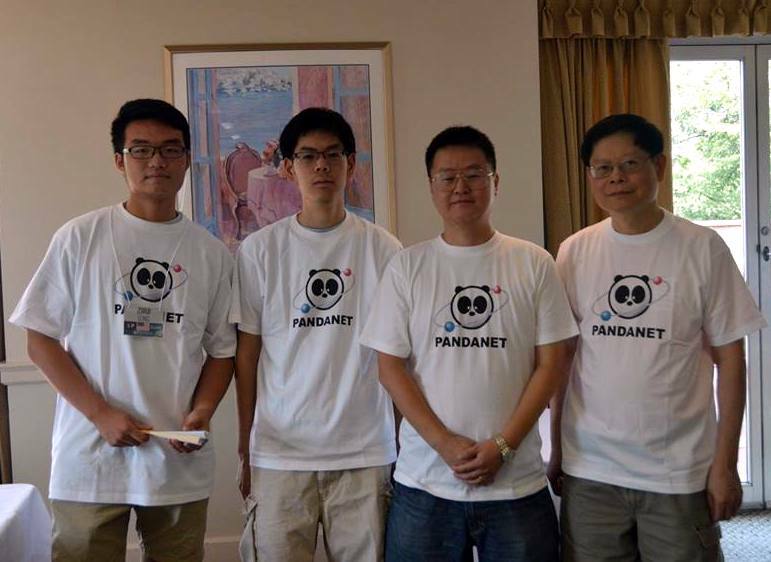 Two weeks ago the latest Pandanet AGA City League started. One of the changes this year is the addition of video commentary for the rounds. In the first round xhu98 goes over some of the C League matches. The games were reviewed live on Twitch and later posted to YouTube. Click on the image on the right to watch two hours of reviews from these matches. In two weeks Nick Sibicky or Andrew Jackson will cover the next round.